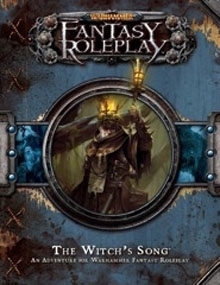 The Witch’s Song is an adventure for Warhammer Fantasy Roleplay. A haunting melody lingers upon the foul mists that swirl along the outskirts of Fauligmere, creating an unnatural tension among the town’s inhabitants. Some say it is the voice of the witch that haunts the Cursed Marshes. Others say it is something even more terrible. Brave heroes are needed to investigate the strange omens that burden this god-forsaken town. The Witch’s Song features a mysterious new adventure that sends players to the fishing village of Fauligmere, not far from the city of Marienburg. Legends of a witch suggest that the unfortunate events plaguing Faulgimere are something more than a run of bad luck. Someone (or something) sinister is surely responsible. Players are pit against nobles of questionable intent, a mystery shrouded in speculations, and a group of fanatics that are quick to answer any cry of witchcraft. This boxed adventure comes with many tools for GMs and players alike, including a full colour book containing the adventure, as well as all the reference sheets, tokens, and cards the GM needs to bring the story to life. For players, The Witch’s Song also includes new rules, spells, and options for hedge magic and witch characters. Get all of the Warhammer Fantasy Roleplay eBooks at RPGNow.com.